The founder of the Presentation Order, Nano Nagle, was honoured on the 300th anniversary of her birth at a commemorative Mass in the Cathedral of Christ the King, Mullingar on Wednesday 21 November (Feast of the Presentation of Our Lady in the Temple). 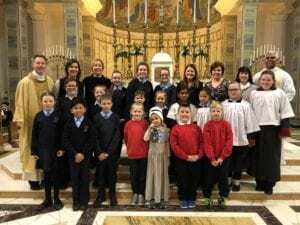 The tercentenary jubilee Mass was organised and attended by pupils and staff from Presentation Junior and Senior Schools inMullingar, which have enrolment of 333 and 360 pupils respectively. Speaking during the Mass, Fr Paul Crosbie highlighted the two key parts of Nano Nagle’s mission: setting up schools for young girls and serving the poor on the streets. 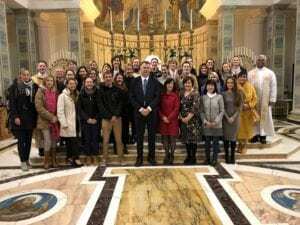 He encouraged the Presentation pupils “to carry the lantern of faith and good works that inspired Nano Nagle to accomplish so much good in her times”. Prayers were offered for deceased members of the Presentation Sisters who served in Mullingar and for the work of the Presentation Order throughout the world. Photo 1: Principals, teachers and staff in Presentation Junior and Senior Schools with Fr Paul Crosbie and Fr Joseph Photo 2: Pupils from Presentation Junior and Senior Schools who took part in the Nano Nagle Mass, teachers Aine Killilea, Alma Manny and Jacinta Sullivan together with Fr Paul Crosbie and Fr Joseph Naikarakudy.